System which protects and provides a deterrent against the theft of your vehicle. It provides two types of protection, exterior and interior, as well as an antitamper function. The system detects opening of the vehicle. The alarm is triggered if anyone tries to enter the vehicle by forcing a door, the boot or the bonnet. The system detects any variation in the volume in the passenger compartment. The alarm is triggered if anyone breaks a window or moves inside the vehicle. If you wish to leave a pet in the vehicle or a window partially open, deactivate the interior volumetric protection. The system detects the putting out of service of its components. The alarm is triggered if anyone tries to put the wires of the siren, the central control or the battery out of service. Do not make any modifi cations to the alarm system, this could cause malfunctions. Switch off the ignition and get out of the vehicle. Lock or deadlock the vehicle using the locking button on the remote control. The alarm is activated; the indicator lamp on button A fl ashes once per second. Unlock the vehicle using the unlocking button on the remote control. The alarm is deactivated; the indicator lamp on button A switches off. Within ten seconds, press button A until the indicator lamp is lit continuously. The exterior protection alarm alone remains activated; the indicator lamp on button A fl ashes once per second. To be effective, this deactivation must be carried out each time the ignition is switched off. Relock the vehicle using the remote control. The alarm is activated again with both types of protection; the indicator lamp on button A switches off. This is indicated by sounding of the siren and fl ashing of the direction indicators for approximately thirty seconds. After it has been triggered, the alarm is again operational. If the alarm is triggered ten times in succession, the eleventh time will result in it becoming inactive. If the indicator lamp on button A fl ashes rapidly, this indicates that the alarm was triggered during your absence. When the ignition is switched on, this fl ashing stops immediately. To avoid triggering the alarm when washing your vehicle, lock it using the key in the driver’s door lock. Do not activate the alarm before disconnecting the battery, otherwise the siren will sound. Unlock the vehicle using the key in the driver’s door lock. Switch on the ignition; the alarm stops. Lock or deadlock the vehicle using the key in the driver’s door lock. When the ignition is switched on, lighting of the indicator lamp on button A for ten seconds indicates a siren fault. Have it checked by a CITROËN dealer. - 45 seconds after the vehicle is locked using the remote control, the alarm is activated, regardless of the status of the doors and boot. - 2 minutes after the last door or the boot is closed, the alarm is activated. 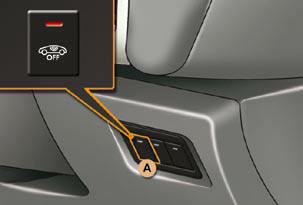 To avoid triggering the alarm on entering the vehicle, fi rst press the unlocking button on the remote control.